Aaron Thomas has put together a nice season for the Windy City Bulls, the newest team in the NBA Development League. Thomas has been one of the league’s best scorers, averaging over 16 points per game. In a recent game against the Erie Bayhawks on Jan. 11, Thomas dropped 22 points. When he’s playing, he can score at will, and the former Florida State Seminole has taken advantage of the opportunity. I had a chance to sit down and talk to the Bulls star about the D-League experience, playing under coach Nate Loenser and playing overseas among other things. Below is the full interview. Colin Mieczkowski: You were a good player in college, and now you’re playing professional basketball in the D-League with a ton of of other great young players, what has that experience been like for you so far? Aaron Thomas: There’s definitely a difference between college and pro. Guys are bigger, more athletic, and strong, it’s just a different level. Not saying that college was a breeze but, the D-League experience has been good. Just to see where I’m at, and all of the hard work I put in at the next level, and see what happens after that. CM: What goes through your mind, when you hear your name called on game night? AT: *Laughs* it’s a good feeling. I’d be lying if I didn’t tell you but it’s a real good feeling. It’s unexplainable honestly, you just go out there and do what you do and not worry about what’s going on on the outside. Just appreciate that you’re here, and take advantage of the opportunity. CM: Working with Coach Loenser, how would you best describe him as a coach, and what are some key things you’ve learned from him so far? AT: Coach Nate, he’s a good coach. He always has a plan, no matter if it’s practice, film or a game. He always has a plan. It’s just on us to execute it and pay attention. He’s always big on playing hard, and just being together and playing together as a team. He’s big on togetherness. CM: What are some things that you want to improve on as a player? AT: Everything. I’d be lying if I told you I don’t need to work on anything. I just work on all aspects of my game, on the court and off the court, just being a professional, period. Just getting prepared for the next level and just life in general. CM: You’ve had a chance to play with some guys from the Chicago Bulls roster when they came here to play for a few games. Did you learn some things from the experience of playing with these guys? AT: Yeah definitely, from each of them. Because the level is different between the NBA and D-League. Just asking them about what the experience was like as far as like the style of play and things like that. CM: You had a chance to play overseas. What are some differences between playing in the Euroleague, and playing in the NBA D-League? AT: It’s just different. You’re out overseas by yourself, so you have to be real mental when you go overseas. You have to be mentally tough and ready for the grind. It’s that simple. CM: Any site seeing while playing in Europe? AT: Oh definitely! I was in Germany so I was in a good city so I was able to see things, as in the history. I tried to learn some German but couldn’t stick with it. So that’s pretty much it, just real different. CM: What are some things that you like to do on your down time, when you’re away from the basketball court? AT: Just talk to my daughter and my girlfriend and play the game. I watch a ton of Netflix so I just be chilling. When I’m here at the gym, it’s time to focus on hoop, but when I’m outside of the gym, I focus on things other than hoop. CM: Who are some players that you looked up to as a kid? AT: I liked Kevin Durant. I pretty much didn’t have a hero. I just had so many guys I liked. I didn’t have anybody specific I favored. I just had a variety of guys I liked. CM: Being in the Chicago area, what are some your favorite restaurants that you’ve been to so far? AT: I’m a big fan of eating, so there’s a lot of food places I’ve been and been interested in. Alfonzo (Mickinnie) is from here so he showed us a couple of things, and places to go, and just some chill spots and just to see what’s fun. 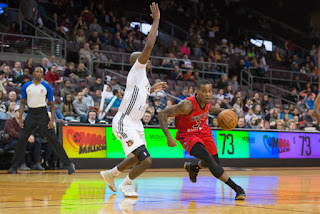 Don’t forget to listen to all home games and read up about the team on your exclusive radio home of Windy City Bulls basketball, SportsTownChicago.com.